CANTON, Ohio — Not too far away from George Halas Boulevard and the Pro Football Hall of Fame, there are endless miles of corn fields that seemingly stretch from here to Wyoming. “Welcome to Canton and the Pro Football Hall of Fame, Fred Dean. It was the perfect backdrop for the biggest day in Dean’s athletic career. The hard work and relentless dedication that has helped define the landscape of this area symbolizes the very qualities that helped bring the former Ruston High School and Louisiana Tech University star to this special moment. 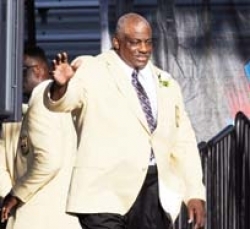 Standing tall on a stage at Fawcett Stadium along with five other legendary figures from the National Football League, Dean was inducted into the Pro Football Hall of Fame here Saturday evening. Joining him: Darrell Green, Art Monk, Gary Zimmerman, Emmitt Thomas and Andre Tippett. “Now we’re all teammates on a different team,” said Dean of his fellow inductees. “It’s the Hall of Fame team, and we’re all happy about this day and what it means to us, our families, our friends and all of those who have supported us to be able to receive this great honor. “Honestly, I’ll tell you, I have found it really tough to believe all of this happening. I never thought about it, I never dreamed about it. Dean and the five other legends of the game are in an extra exclusive fraternity. Less than 1 percent of the players who have put on an NFL uniform since the sport’s inception have reached Canton. Dean did, the first-ever Ruston High graduate and second from Tech (the other was Terry Bradshaw) being named to four Pro Bowls and as both an NFC and AFC Defensive Player of the Year, the latter two awards coming with two different organizations (San Diego Chargers, San Francisco 49ers). With the 49ers, “Mean Fred” was a major factor in two Super Bowl titles. “Fred was the catalyst that put the 49ers into the next generation of champions,” said Edward J. DeBartolo Jr., the former team owner who presented him for induction into the Hall of Fame. “When coach (Bill) Walsh traded for him in 1981, he knew that Fred could be the difference maker. “Single-handedly, Fred made the difference in our defense going from being very good to great. He had the great quickness and speed that we needed and, from there, we took off on a great run of Super Bowls. But had he not passed away several years ago, Walsh would have been the pick. It was in early February that Dean and the other inductees got word of their election to the Hall of Fame, but the feeling began to truly sink in this weekend. And in the days leading into the enshrinement ceremony that became an official sellout nearly two months ago, the Arcadia native admitted that “I was more concerned about making sure my acceptance speech went right than about getting the gold jacket or the bronze bust. Dean and the other inductees made a “bet” earlier in the week about who might “break down and cry,” but all also agreed that it would be near impossible to go through the entire weekend and not feel some special emotions. “The veteran Hall of Famers, the ones who have been inducted before, they all were telling us this week that you’re going to find out how tough it is to keep from being emotional,” he said. An estimated 250 supporters of Dean were in attendance for the various events surrounding Saturday’s induction ceremony. Father Rural Dean was there and so was wife Pam. Such former Tech teammates as Charlie New, Lewis Frost and Tony Jones were there. Jerry Attaway, a former assistant coach for the 49ers, flew in from his home in Nevada. He wasn’t about to miss this special day for Dean. “Fred made himself into a great player. Hours upon hours, he would be working on certain stances or how to rush the passer, and it was outside of what we were doing as a team. Just as with that tree and those endless rows of corn stalks rising out of the Ohio farmland, Fred Dean stood tall here Saturday.